The LG Arena (KM900) has recently been voted the European Green phone of the year by the European Imaging and Sound Association. (EISA) LG electronics also won 3 separate awards for various different products. The awards will be given to LG on September 4th 2009. The LG Arena has a great design and features a touch screen, 3G and a 3D S-Class user interface. 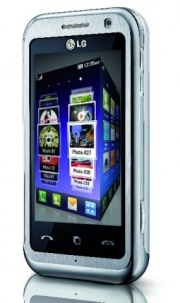 The Arena was found to be the best environmentally friendly packaged mobile phone in Europe. Not only was it found to be the ‘greenest’ handset but also sets the standard in respect of material and component application. Both intelligence and beauty are found in the LG-KM900 to produce a stunningly ‘green’ fully featured mobile handset. Other awards that LG electronics picked up included European best value LCD TV for the SL8000, best value Blu-Ray Player for the BD390 and best European HT System for the HB954PB.